Late Gen BC Joshi was undoubtedly one of the most visionary chief Indian Army has had. The Rashtriya Rifles, residential Army Public Schools and Professional Institutes for the wards of servicemen are some of the outcomes of his vision. Amongst the policy guidelines promulgated by him on assuming office as the chief was the one on the status of Commanding Officers. Here was one general who realized the pivotal role played by the COs within the organisational framework of the Army. He therefore mandated that they be enabled, empowered and accorded the status due to them as Commanding Officers. A small but very visible indicator of this was that the signs that used to read “Flag Cars Only” were amended across the army to say “Flag Cars and COs Vehicles Only”. Seemingly insignificant, but extremely meaningful in a hierarchical organisation like the Army. Today, fifteen years down the line, the signboards are still there – but the spirit of the order, sadly, doesn’t seem to be. Not that this decline is something that will be readily acknowledged by very many people. For all intents and purposes, the buck still stops at the Commanding Officer. But often this is merely the buck of accountability and rarely the buck of authority. Reasons, rationales and excuses can be found. It could be the greatly improved communications – today it is actually possible for the highest of headquarters to breathe down the neck of a platoon commander carrying out an operation – or the microscope of media scrutiny under which every operation (or suicide by a soldier, for that matter) is placed today. Whatever may be the reason for this extreme risk aversion, the result cannot be very healthy. “When I was a battalion XO in Iraq in 2003, I served with a company commander whose vehicle was struck by an early version of an IED. The fragmentation shattered his windshield and severed his antennas, the smoke and dust obscured his vision and the blast temporarily deafened him. In the first critical seconds after the blast, the commander saw the ubiquitous white pickup leaving the blast area, but didn’t pursue it. His battalion commander was furious, and later harangued the captain for his failure to act. The company commander was crushed; he felt the battalion commander was questioning his courage, and in fact he was. Forget about young officers – imagine the damage caused by curbing the initiative of commanding officers. Therefore, in supreme organisational interest, the tigers must be allowed to roar. 5 Responses to "Let the tigers roar"
very true and apt write up. Tigers are the anchor pins of any army. 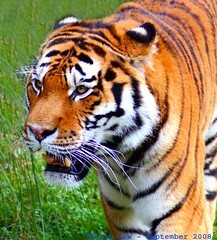 Usually, tigers do get their due unless they prove incompetent. we need to first decide who is a Tiger? and when does he become a Not tiger! the fact is that All tigers continue to be tigers despite moving up the ladder and over power roars of other tigers ruling the lower rungs of hierarchy. hats off to gen joshi…..